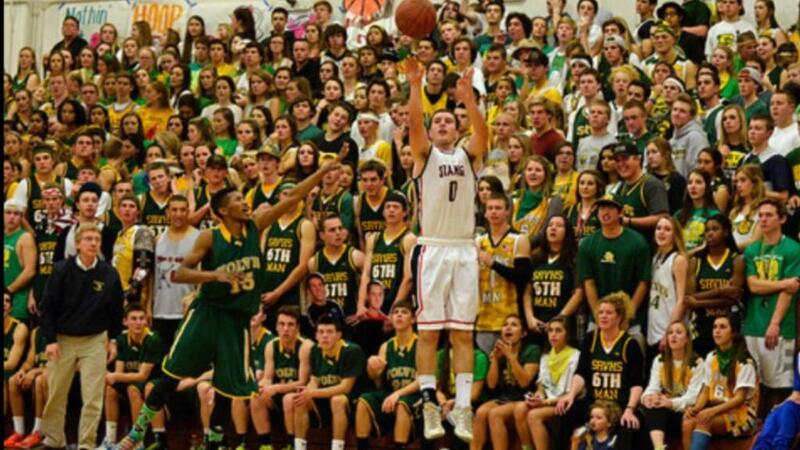 DANVILLE, CA- The San Ramon Valley Wolves arrived to play Monte Vista riding high hopes of capturing an East Bay Athletic League title, however the Mustangs would have something to say about that. The Wolves came into tonight’s game riding an eight game winning streak as they beat Monte Vista at San Ramon, in overtime, by a score of 59-56. Luck wouldn’t strike twice for the Wolves as Monte vista, with the help of great play all-around, would go on to win and take the EBAL Championship by a score of 56-45. Monte Vista guards Trevor John and Grant Jackson helped lead the offensive charge for the Mustangs as Spencer Rust also stepped up big down low. John, the Cal Poly Commit, went 8-16 shooting for 22 points and Jackson went 5-8 for 15 points. Spencer Rust added 15 points and nine rebounds on 7-13 shooting. The Mustangs kept the tempo in their control all night long and used home court to their advantage. The Monte Vista lead was floating around 10 points or more for a good chunk of the game. As for San Ramon Valley, it seemed to be a constant struggle for them all night long. Standout Wolves guard Jerry Karczewski went just 2-9 shooting for 11 points, while star forward David Gunn went 3-9 shooting for 11 points. Normally a great shooter, sophomore guard Austin Henderson went just 1-6 from the field for three points on the night. “I think we all wanted to win this game of course, but losing I believe will give us the fire to play our game to the best of our abilities. We will come back in playoffs with better rebounding, overall hustle, and determination,” said SRV junior guard Keith Smith. The 7th ranked team in California, Monte Vista, will finish the regular season with an outstanding 25-1 record, going 13-1 in league. There is no doubt that the win over San Ramon will give the Mustangs momentum headed into the North Coast Section playoffs, as they will likely draw a number one seed. As for San Ramon, the Wolves will now have to rebound from coming so close to an EBAL title and losing. As for the 31st ranked team in California, the Wolves finish the regular season with an overall record of 22-4, going 11-3 in league. Even with the disheartening loss, San Ramon will have a great seeding in the NCS playoffs as they look to come back ready to win.